Next week, the eightieth birthdays of two very different composers are celebrated in New York. 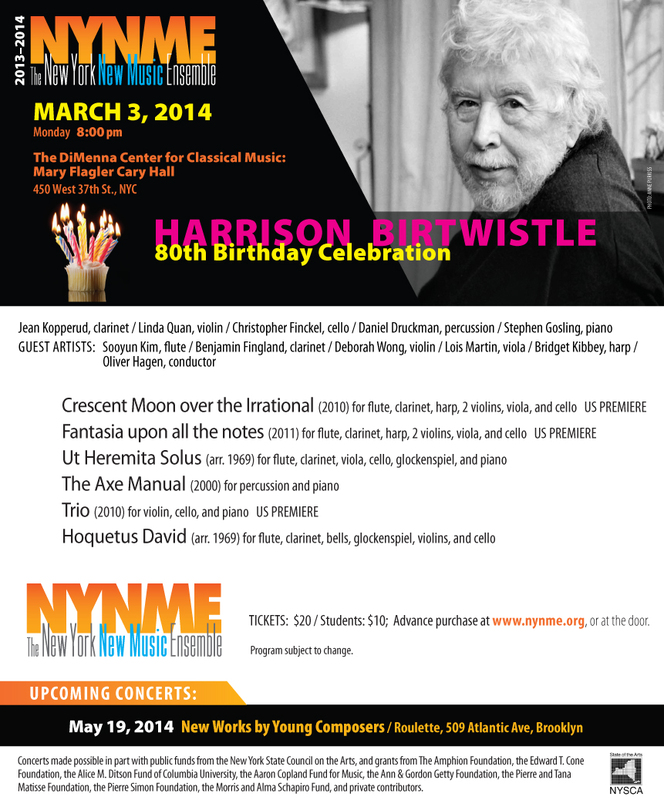 On March 3rd, New York New Music Ensemble fetes English composer Harrison Birtwistle with a portrait concert at the DiMenna Center (details here). Cygnus Ensemble and several soloists perform the music of Mario Davidovsky on the 4th at Merkin Concert Hall (details here). While Birtwistle is best known for his stage works and Davidovsky is known for his Synchronisms, music for electronic tape and soloists, both have written compelling chamber music and this is what will be the focus of these two events. Happy birthday to them both! This entry was posted on Thursday, February 27th, 2014 at 10:05 pm	and is filed under The New Classical. You can follow any responses to this entry through the RSS 2.0 feed. Both comments and pings are currently closed.